Came across this information this morning from another blogger. An ad she found at Facebook and at YouTube. I wasn’t able to find what she found at the source on Facebook, so it is copy and paste with a shout- out to her blog. In Naselle, Washington, just down the road from us, another local business person is having to close up shop. The why details are included in her offer (below) to win her business, and have it relocated to within 500 miles. You Could Win This Business!! Natalie Morgan, owner of The Cool Cow Coffee Company in Naselle, closed its doors for good, after the town’s most recent disaster. Ms. Morgan had owned the drive thru espresso and deli for eighteen months when she witnessed the rising water from the Naselle River engulf the entire neighborhood before encompassing her business. Now she is hoping to give the opportunity of ownership in a new location to one hopeful entrepreneur and create even more jobs in the process. Natalie had spent almost two months on the remodel after purchasing the business from its previous owner in June of 2007. She painted it apple red, added cedar shingles to the base of both of the buildings and adorned the structures with all sorts of country details including a life size Holstein cow that had been shipped in from Texas and proudly displayed on a platform at the front of the building. The cow is such an eye catcher that people would often stop to take pictures of her. Natalie even held a contest to name the cow and then let her employees pick the winning name. She planted flowers and hanging baskets in the summer to make the space even more beautiful and painted the picnic tables outside to match the buildings. No detail was overlooked, from the black and white cow patterned tip cups which read “Cow Tipping Allowed” to the little chocolate cow cookies that were given out with each and every beverage and ice cream treat, it was apparent that the new owner had poured her heart into every detail and it did not go unnoticed. On the day of the flood the water had already overwhelmed the local fire and rescue building located directly across the parking lot from her espresso stand when the phone call came in from the red cross warning people in the area to evacuate. Natalie and her husband quickly moved as much of the equipment as they could up off of the floor, and then they locked the door and drove out through the rising flood water now just inches from the base of their building. The Cool Cow Coffee Company had already been struggling in it‘s present location and the weak economic condition of one of the poorest counties in the state was not helping the locals to afford the luxury of one of the treats from the towns best coffee kiosks and delicatessen. In December of 2007 Naselle, Nellie the life-size Holstein cow that is perched high above the drive through eatery withstood the one hundred mile an hour winds that had crumpled the metal roof of the fire department next door, but this December that cow would find herself abandoned due to heavy snow fall and an inaccessible mountain of snow and ice left at the entrance of the business by plows clearing the nearby highways. By the time a local contractor was finally able to clear the two feet of snow surrounding the coffee stand, it had only been open for five struggling days when the flood waters surrounded the buildings causing a power outage to the storage unit and a complete loss of perishable inventory. The shop has not been opened since that dreadful day, January 6, 2009. With revenue dwindling, cash flow almost nil, inventory gone, quarterlies and property taxes soon due, Natalie had no choice but to close her shop. She applied for assistance from the Small Business Administration’s Disaster Loan program, but was denied because of her inability to pay back the loan due to her recent loss of income. Even before the flood, like so many other communities and businesses in and across the nation, Naselle’s economy has also been hit hard and with the impending threat to close one of the areas main employers, the Naselle Youth Camp, Ms. Morgan feels that there is simply no hope for her shop to prosper in its present location. Buyers in the area are far and few and even if a buyer were to come along and make an offer equivalent to her initial investment, she could not sell it with a clear conscience knowing full well that it will probably flood there again. It’s become obvious that if this business is to prosper, than it needs to be moved to an area with improved economic demographics, but Natalie and her husband, Pete, have spent the past five years physically building their home in Naselle and they still have a great deal of work to complete before they could relocate, so moving the business and relocating themselves is not an option at present. With so many people out of work, so many layoffs and so many struggling financially right now, she hoped that somehow she would be able to turn this tragedy into a positive experience for someone whom lived in a more prosperous and populated area and maybe even create a few more jobs in the process. So she logged onto the Washington State Gaming Commission’s website and while reading through the state gaming regulations, she came across something called an essay contest. In this type of contest the prize is awarded to a winner based on a skill not chance and in this case the skill that each person’s entry will be judged on will be a creative writing project where the subject matter is based on a desire as well as a need to become self employed. Interested persons are asked to write an essay describing why they should be given her coffee shop and are to pay a $25 entry fee with their essay. The entry fee will help Natalie to recover her initial investment and pay for any sales tax due to Washington State, the cost of the structure(s) relocation including relocation permits and fees by the contractor, free consultation on new site selection and location, all of the business’s equipment by way of a U-Haul rental truck, one week of free training in the shop at it’s new location by the shop‘s previous owner, all signage, menus and $2,000.00 cash to aid with the business’s start up costs, plus a new floor and sub floor to be installed at the building(s) new location. It’s a win-win for everyone involved. Especially in today‘s difficult economic times. Natalie gets her investment, not to mention her health, back, the state gets a healthy sum of revenue out of the deal, some lucky, possibly even presently unemployed person gets the chance at owning and running their own business and perhaps even creates a few jobs in the process. Write an essay explaining your current economic struggles and why you would like to own The Cool Cow Coffee Company. Be sure to include your written essay with your name, address and telephone number printed on the top, include a self addressed stamped envelope and the $25 entry fee. Entries must be postmarked no later than May 31, 2009. We must have at least 2,500 entries in order to award the prize. If we do not receive enough entries by May 31, 2009, your entry fee will be mailed back in the SASE you provide. If all goes well and we get enough entries to award new ownership, the winner will be notified by phone on June 6, 2009 at 7PM. Please, due to the high cost of structure relocation we can only relocate this business within five hundred miles of its present location in Naselle, WA. If the business’ new location is to be outside of that five hundred mile radius you will be responsible for paying the difference in relocation costs at the time of signing. The winner must sign title of ownership within 5 days of acceptance of The Cool Cow Coffee Company and will have 30 days from the date of signing to find and prepare a new site for the business to be relocated upon. A foundation for the main structure of 9‘X18“, all utility hookups, local permits, fees, lease contracts and/or rental agreements are the sole responsibility of the winner. All such arrangements should be made within 30 days of signing the title. The business structure(s) and their contents must be relocated within 30 days of new ownership, or no later than August 15, 2009. The $2,000.00 cash award will be given to the winner on the first day of training. However if financial assistance is needed to aid the new owner with utilities, rent/lease, fees and permits etc., arrangements can be made to draw off of the cash award in the form of checks written directly to these agencies and/or land owners, but not to exceed the total sum of $2,000.00. Training will begin on a date specified by the new owner and will not exceed a 7 day training period in succession. If you have any questions you may e-mail Natalie at nmorgan@wwest.net. If you would like to see more pictures of The Cool Cow Coffee Company go to You-Tube http://www.youtube.com/watch?v=LoDrEXR8PQA and view my video. Flowers Arrived; doesn’t the gift of flowers just make you smile! 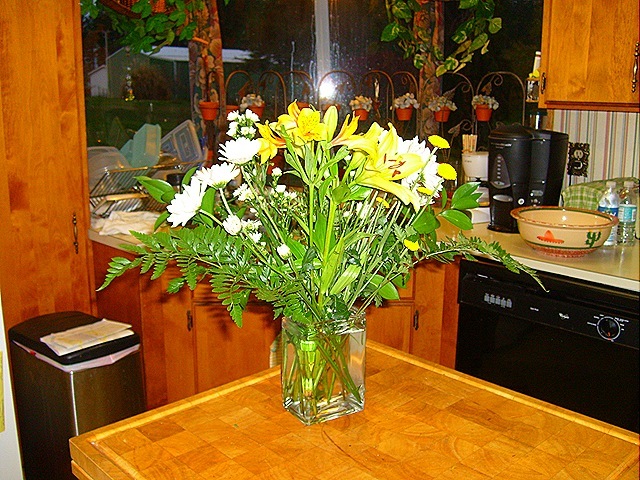 Daughter and son-in-law had flowers sent to my house; meant to arrive Easter weekend. Since we live as far away as we do from urban centers, it takes UPS a bit longer to deliver, so the flowers arrived a couple days later than they planned, but the flowers did arrive. Came in a florist box that looked like long stemmed roses might be inside. Opened the box to find fresh spring flowers, a hefty square glass vase and florist preservative packet, along with a happy greeting card from my daughter and son-in-law. I learned later in talking to my daughter that she had chosen another arrangement, but where we are located there are no florists in close by vicinity that could accommodate the choice she made. 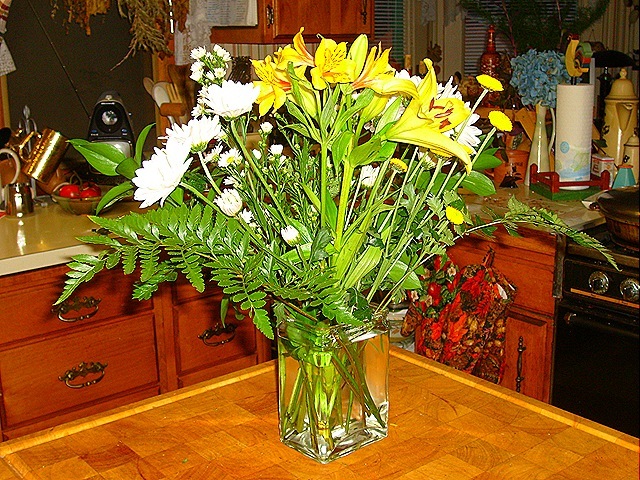 I am happy with what was sent – fresh spring flowers that are still looking fresh a week later. Picture below. After a too long time away from my paints, brushes, and the messy operation that is oil painting, yesterday I completed two paintings! The paintings I’ve accomplished grow fewer and fewer over the years since 2006. Lots of reasons why, but I hope this change in momentum means ‘I’m Back’! I sought out the old painting clothes and found I’ve outgrown them (that means I weigh more now than I did when last I wore them). Time to set aside another set of painting attire, in larger size. Painted this scene in 16 x 20 size. And then painted the scene again in 11 x 14 size, although it has variables from the larger size, making both ‘originals’. I took photo of the larger size and the paint is still Wet! The house just doesn’t have much accommodation room for paintings to dry. There is the cat who can jump up anywhere, so the paintings need to be in a room with a door that closes. And as I looked around the house, I see we don’t have many ‘roooms’ that have doors that close. Then there is the odor of oil painting that can permeate the air. If I’m going to paint frequently, I need to figure out the logistics for these challenges. 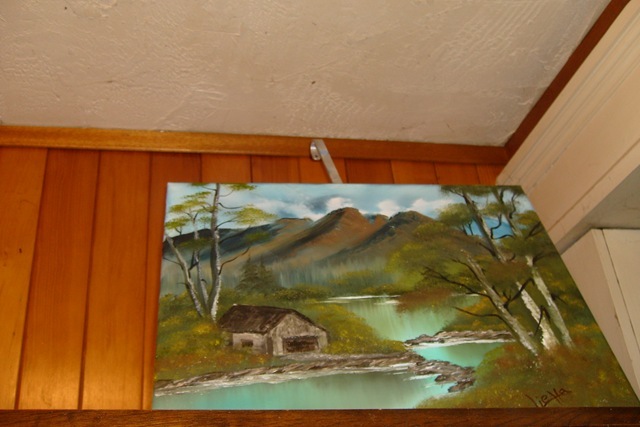 So we put the Wet Painting on top of a wardrobe (a place the cat has not yet figured out how to climb) and I snapped a few photos … not very good photos due to the angle of looking up at the painting, and the paint is still ….. well Wet! What is Bay Center Association? We do have in our little community what is called Bay Center Association. It is a service-oriented group comprised of willing volunteers from among the community of Bay Center. Residents of Bay Center are automatically members of the Association. The Association goes back to the early origins of the formation of Bay Center. I’ve seen documents in the Association records that show the sense of community in advocating that males in the community donate one day a month towards helping with the heavy work in making improvements within the community. I’ve seen an old photo at the Dock of The Bay which shows what looks like a community dinner with long tables set up for a shared meal. Since we moved here to Bay Center, in Nov 2002, my husband agreed to hold the office of President, when a neighbor was telling us as newcomers about the Association and the timing was such that it was time for a new slate of officers. We were too new to the community then to know much of anything about how the community works together. Both of us were employed at the time and I helped him where I could and we rather bumbled our way through that first year of holding office. At that time it was called Bay Center Improvement Association. By March 2003, our country had invaded Iraq, and two from our immediate family who were active military deployed to Iraq; my son-in-law and my nephew. I left my employment to be more available to my daughter and her three children (my grandchildren) while her husband was deployed. Spending intense years in activism from 2003 through 2008 as a military family speaking out against the Iraq war, I did not get much involved in local region community, nor in my immediate community of Bay Center. (Not wanting this to be a blog post about Iraq war, you can see more about my activities if you are interested at my blog; Dying to Preserve the Lies). With the winter windstorm (hurricane) in Dec 2007, my attention quickly was turned to the immediacy of living in our small community within this sparsely populated county. I began attending the different meetings of the different groups that are at work in our unincorporated village to get a stronger sense of how we interact as a community, especially in times of severe weather crisis situations and other crisis situations. I did attend some of the Bay Center Association meetings and like many groups or organizations, the heavy lifting is handled by the few who do volunteer for as long as they are willling to lift or until they say no more. Then the hunt is on for who else would be a willing volunteer. And that is how I came to agree to take on the function of president for the Bay Center Association for this next year (May 2009 – April 2010). I agreed when two other new to the Association meeting attendees agreed to take on some of the other offices, which gives the Association a slate of ‘new’ and probably green officers. So it should be interesting to see what develops over the next months, and if nothing else, it will make for some material for blog posts here. First thing I do is create a website for Bay Center Association… check it out! Content will likely be developed from the monthly meetings.